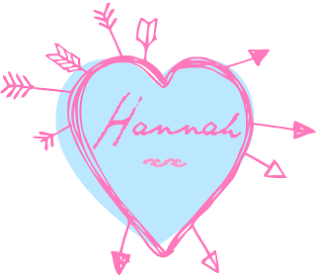 Today we have the lovely Hannah guest posting on my blog. Hannah is the wonderful lady who is responsible for my blog header!... Over to you Hannah! This Ikea desk is perfect for the small space I have for my mini office. I choose to keep it white as my room is white, and I'm really liking Home Decor that's white with a pop of colour added through accessories at the moment. You can find this desk HERE! I chose this cushion to put onto the white desk chair I chose. It adds a more comfy feel to the clinical white, and I chose this one because it reminds me of home and makes me happy. This cushion is from Debenhams and you can find it HERE! I thought a print would brighten up the space and add in more colour. 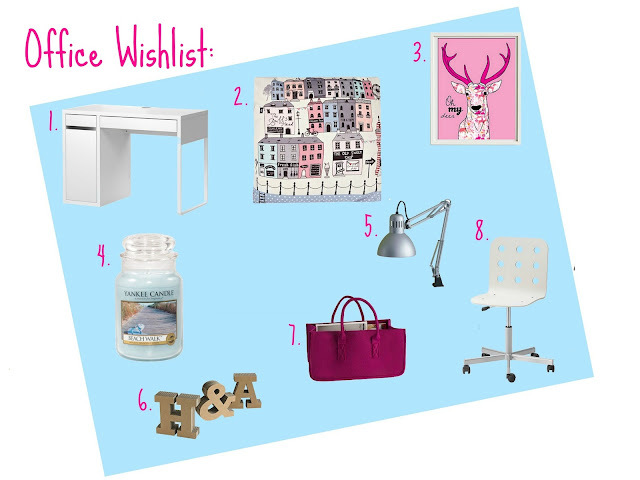 I was looking for an inspirational print but when I saw this I thought it was too cute not to add to this wishlist! You can find it HERE! I think a candle is always something lovely to have in an office to give off a scent and also look pretty. I'm very picky about scents I'm not really fan of most scents either flowery, spicey, or pretty much the majority of scents on the market. I prefer fresh scents like beach walk from Yankee Candle which you can find HERE! Everyone needs some sort of lighting in their office. I chose this lamp as it is a easy to use adjustable lamp, so great for a desk. It is from Ikea so also really affordable which always helps, you can find it HERE! I really want some Letters to use as book ends for all my blogging inspirational books. I would love to get A and Z for the alphabet. I would either paint or get some cool wrapping paper to cover them in! You can find them HERE! I think a swivel chair is a necessity for a desk, for all those moments when your bored and spinning around on a chair can give a bit of inspiration. I like this one because it fits in with the desk, it's from Ikea and you can find it HERE! I find magazines great for keeping up with trends and really inspiring for blog posts, so I like to keep a few of my old favorites and current ones for when I'm feeling stuck in a rut! I think this storage basket is great for keeping them tidy but in keeping with the decor! What would you include in your Office? Thanks so much to Rachel for having me as a Guest on her lovely blog! I've seen so many ideas for these on pinterest, I go crazy! Love it! We were referred to this storage place by a friend and was pleasantly surprised by the personalized service and the friendliness of the staff. Also there were no leaky ceilings.